If there is one thing this game does well, it is promote the accumulation of stuff. One of those "stuff" things is mounts. There are achievements for getting 100, 150, 200 and 250 mounts. I'm working on the last one, Mountacular. I'm currently at 222 mounts. Twenty-seven more and I ... yeah...27 more, about that. I'm kind of down to the ones that I need help doing, the raiding mounts. There are a few places I can go by myself where, if the Random Number Generator is feeling particularly nice, a mount can drop. 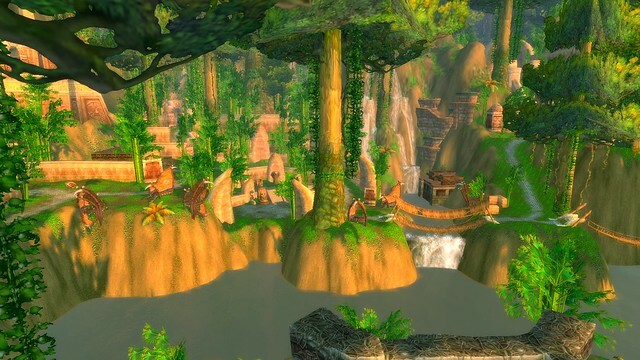 One of the places is the 5-man instance from Cataclysm, Zul'Gurub. I flew over there one weekend morning after failing to find the battle pet up outside of Karazhan. You can see the walls of Zul'Gurub from the area in front of Karazhan so hopping onto one of my flying mounts, I was into the area in no time. I was struck by the beauty of the place in the morning light. When you fly over the walls, the mobs in the instance don't spawn. You could, in theory, use this as your personal fortress. The photo also reminds me that so much has gone into the creation of this game; the nuances of color, the running water, the buildings and, the light of a morning and how it all looks. You can spend hours flying around looking and not see all of it. I've gone here a number of times, but it was this angle that caught my eye. Amazing.